BEING stuck in traffic has become part of everyday life in the Philippines — the cost people pay to enjoy the benefits of city living. But the frustrations of many can be a gold mine to some — and it’s hard to imagine an industry benefiting more from road congestion, with the captive audience it creates, than billboard companies. “Traffic is a main contributor to the growth of out-of-home (OOH) media because as people are stuck in the cars and in public transportation, the more they will be away from traditional media,” said Lloyd Tronco, Executive Director of the Philippine Center for Out-Of-Home Media Research and Science (PhilCOuRSe), in an interview with BusinessWorld. The average travel time on EDSA, from Monumento to Taft Ave., is 95 minutes, which can rise to 180 minutes in peak hours. Data from the Japan International Cooperation Agency and the the Land Transportation Office suggest that clogged roads in the Philippine capital cost the economy P2.4 billion a day, or around P200 per capita. Part of the reason for this congestion is that hardly anyone ever stays home. Astudy published by PhilCOuRSe reveals that only 14% of Filipinos stay at home 100% of the day while the 86% are out and about, creating the traffic that helps make OOH a viable alternative to other forms of media. “And even for the 14% who say they remain at home, within the span of the time they are at home, a quick run to the corner sari-sari store will expose them to an outdoor ad. 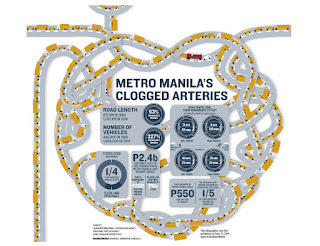 Though not necessarily a big billboard on EDSA, it is still OOH media,” Mr. Tronco said. Billboards are nothing fancy technology-wise — in fact they’re thought to be one of the earliest forms of advertising. They took off sometime in the late 18th century, when lithography made the commercial printing of large signs possible. Yet the old dog still has has a lot of tricks in it — in the Philippines OOH media spending commanded 11.2% of total advertising expenditure in 2013 — significantly higher than the global average of 7.4%. That 2013 represents a steady rise from 7% in 2007. But the conditions for the rise of OOH were sown long before, in the dramatic rise of vehicle ownership over the last three decades, from a mere 446,000 in 1980 to 1.9 million in 2010. Beyond vehicle ownership and congestion, could there be cultural reasons behind the popularity of the medium? “Add to the fact Pinoys are artists. The popularity of billboards is tied in with the fact that many sign painters could come up with good signs in a few days. Recently, the quick turnaround in terms of production due to digital tarpaulin printing made it even more popular,” he added. Remrick E . Patagan, Research Director of the Institute for Development and Econometric Analysis (IDEA), believes the growth of the OOH “billboard” industry hinges on the natural reliance on visual focal points, especially when traveling. He also shares Mr. Tronco’s insight that “traffic congestion likely plays a large role in the growth of out-of-home advertising ” as slow speeds on the roads force commuters to be consumers of OOH media. “Traffic congestion leads to slower vehicular speeds and long commuting times, essentially creating a captive market of commuters that can be exposed to visual advertisement,” Mr. Patagan said. The process of erecting billboards, according to Zeno Martinez, Business Innovations Manager at NextMedia Advertising & Communications, is a collaboration between the vendor and the advertiser. “The billboard is owned by a vendor. The vendor puts up the structure then leases the property — he sells it to the agency or the advertiser,” he told BusinessWorld in an interview. When it comes to regulation, however, there are no clear guidelines on the installation and operation of billboards, and the current arrangements mean the industry is largely self-regulating. With the closing of the Advertising Board of the Philippines in October, much of the regulation fell onto the lap of the Outdoor Advertising Association of the Philippines (OAAP) — formed by advertisers in 1964 to promote the growth of the industry. But according to Mr. Tronco, who is also a member of the OAAP, the government needs to step in with laws to govern the industry. “A Magna Carta is needed for everything to be clearer because right now, the billboard operators are building on the basis of obtaining building permits and following the building code. But there are no clear stipulations pertaining to billboards. It’s a gray area,” he added. It was an unexpected event from 2006 — typhoon Milenyo (international name: Xangsane) — that helped tighten up building standards after the toppling of more than 20 billboards. “Things became stricter. Whenever there’s a storm or typhoon nearing, we broadcast it to the members of the OAAP to take them (the billboards) down,” said Mr. Martinez. understand that it has to be rolled down because if they topple, they’ll be the ones to draw the flak from social media,” he added.